The Institute of Marine and Limnological Sciences and the Research Center Dynamics of High Latitude Marine Ecosystems – IDEAL of University Austral of Chile and the Research Center for the Oceanography of the Southeastern Pacific – COPAS Sur Austral of the University of Concepción, Chile are organizing an Austral Winter Institute that is focused on the general theme of “Approaches and Tools for Numerical Modeling of High Latitude Ecosystems”. Interested participants should apply through the Austral Winter Institute website and may apply for one or more course. Applicants should indicate how a course relates to their research. The application deadline is 15 May 2019 (extended). Applications will be reviewed by a selection committee and successful applicants will be notified by late April to early May. 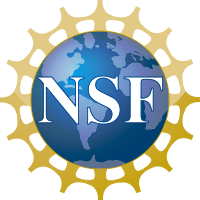 The U.S. National Science Foundation (NSF) is providing funding to support participation in the Austral Winter Institute for U.S.-based graduate students and early career researchers. U.S.-based applicants who are interested in applying for funding should complete the online registration form and submit a recommendation letter from their advisor and curriculum vita to Dr. Eileen Hofmann (hofmann@ccpo.odu.edu). Questions or additional information requests about NSF funding for the Austral Winter Institute should be directed to Dr. Hofmann. Limited funding for non U.S.-based applicants will be available. These applicants should complete the online registration form and send curriculum vita and recommendation letter from their advisor to Dr. Andrea Piñones (andrea.pinones@uach.cl). Questions and requests for additional information should be sent to Dr. Piñones. 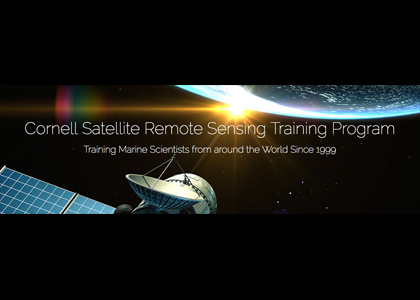 The Ocean Carbon & Biogeochemistry (OCB) Program (www.us-ocb.org) will support tuition, travel, and housing expenses for up to five U.S.-based students or postdocs to participate in the 2019 Cornell Satellite Remote Sensing Training Program taking place June 3-14, 2019 at Cornell University in Ithaca, NY. If interested, please send a 2-page CV and a 1-page statement of interest to the OCB Project Office (hbenway@whoi.edu) by March 29, 2019. The statement should describe your interest in the course and its potential to enhance your research. 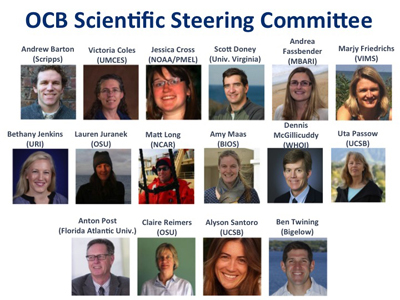 Application materials will be reviewed by the OCB Project Office, OCB Scientific Steering Committee leadership, and the course organizer Bruce Monger. This is a full immersion class and participation for the entire 2 weeks is required. 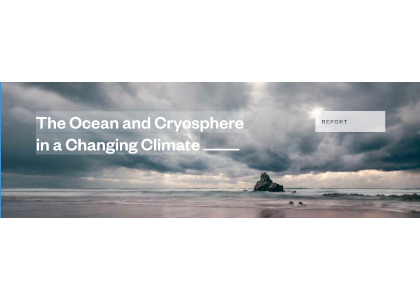 Community review of the IPCC special report The Ocean and Cryosphere in a Changing Climate is open until December 19. Click here to visit USGCRP site to access the document and submit comments. Reviewers can also submit comments directly on the IPCC website. The process is explained in a Federal Register announcement here. Reviews on Chapter 5 can also be sent directly to Shallin Busch or Dwight Gledhill. Self-nominations are welcome! OCB SSC members serve a term of 3 years. For more information on the OCB SSC, including a list of current and previous SSC members, the SSC charge and terms of reference, and links to the past year of SSC minutes, please visit the SSC page of the OCB website. 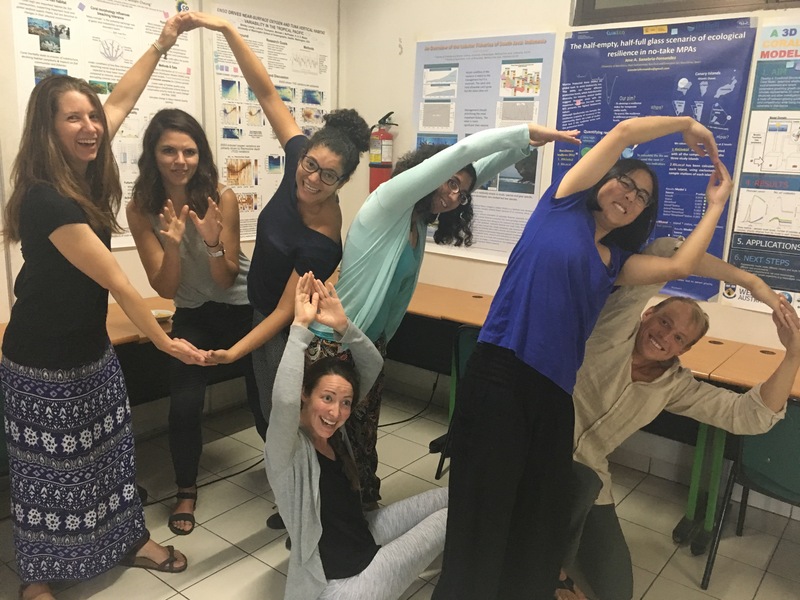 OCB-supported participants work together to form the letters “O” “C” “B” (Image courtesy of Lisa Maddison, IMBeR IPO). Beatriz Dias is a Ph.D. candidate at the University of Massachusetts Amherst, Department of Environmental Conservation. 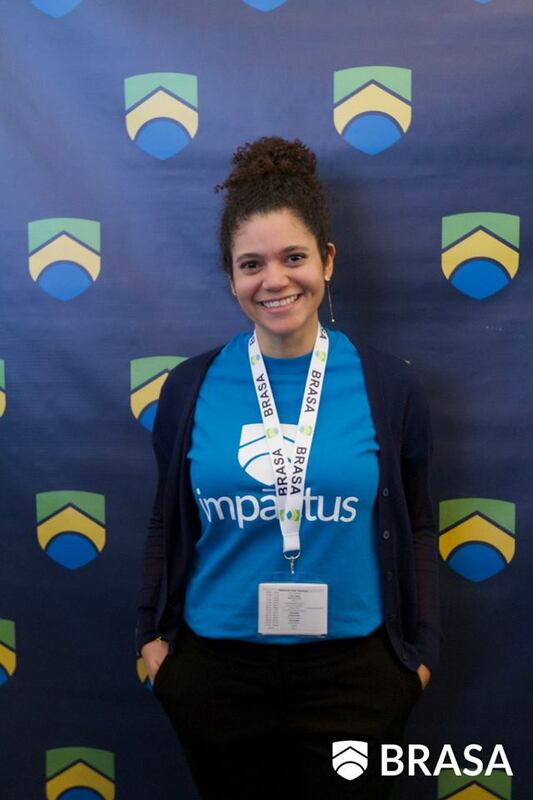 Her work includes developing models to aid management decision making in Northeast US large marine ecosystem and Northern Brazil. Her work includes exploring different fisheries management scenarios effects on marine food webs and identifying monitoring priority areas for species of concern. 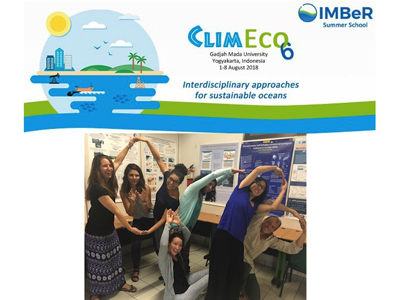 Participating in IMBeR ClimEco6 Summer School expanded my horizons to the importance of interdisciplinary research and collaborations to tackle the current issues impeding oceans sustainability. I was able to learn different aspects of social science, economics, and governance using current examples. 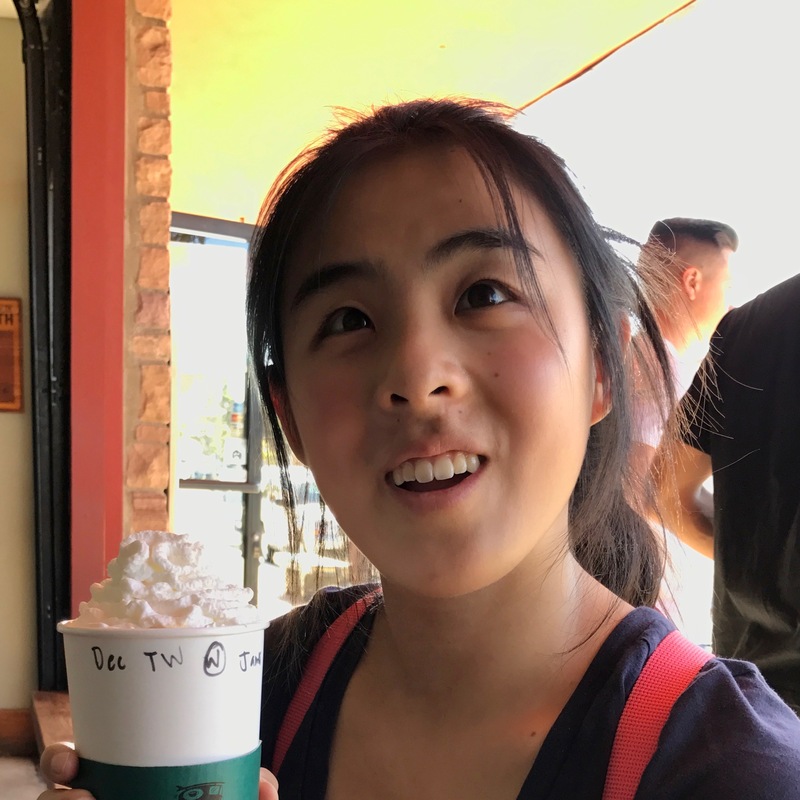 The summer school was a life-changing experience, as I hope to incorporate these new research techniques to my quantitative modeling skillset and build future collaborations with my fellows’ summer school attendees. Heather Welch is a research associate at t he Environmental Research Division (SWFSC, NMFS, NOAA). 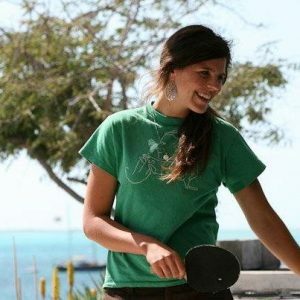 Her current work is developing and operationalizing dynamic management tools to allow for real-time human responses to changing environmental and ecological conditions. 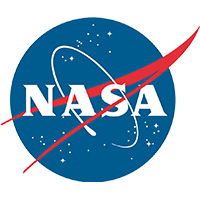 This work integrates remote sensing, species distribution modeling, and app development. I found the IMBeR ClimECO summer school to be an incredibly valuable experience. I was exposed to concepts and methodologies outside my own discipline, and also gained contacts and friends from a wide array of geographies and areas of expertise. This course gave me the tools to approach my work with an interdisciplinary viewpoint. 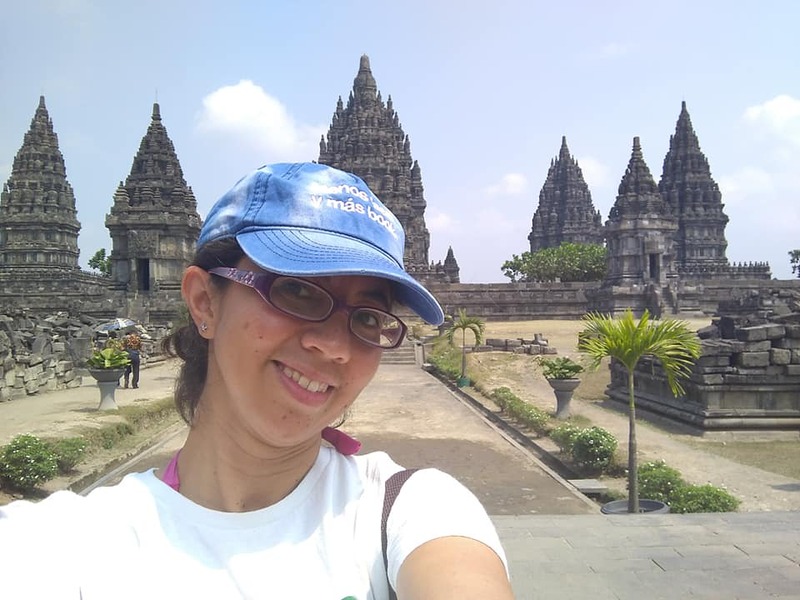 Dr. Claudia Gabriela (GaBy) Mayorga Adame is a postdoc at the Marine System Modelling group of the National Oceanography Center in Liverpool, UK. She uses ocean circulation mo dels, biogeochemical and particle tracking models to understand bio-physical interactions in the coastal ocean. During her PhD program, she studied larval connectivity among coral reefs of the Mesoamerican Barrier Reef and the Kenyan-Tanzanian coasts. For her postdoctoral research, she studies the spatial and temporal scales of connectivity in the North Sea, focusing on evaluating the larval connectivity of sessile marine organisms that have colonized subsea oil and gas platforms. Her new project investigates how changes in currents and hydrographic conditions triggered by climate change will affect the marine ecosystem of the UK shelf seas and the key intermediate services (i.e. primary production, oxygen uptake, nutrient cycling, pelagic habitat) provided by the lower trophic levels. The IMBeR ClimEco6 summer school in Yogyakarta, Indonesia was a great learning experience. The program was truly international and interdisciplinary. The lecturers were experts on marine sciences, social sciences, and economics from top institutions in Australia, Canada, Brazil, France and Indonesia. Lectures were really well planned and presented in a way accessible to all. The complexity of the topics was build up nicely with examples specific to the marine science field. Most of the sessions included exercises that allowed the participants to interact. Working with participants from different fields and nationalities was very enriching and helped broaden my perspective. The summer school truly broadened my network and understanding of other fields. I not only learned about interdisciplinary research, I experienced it! I am grateful to the OCB Program for their support to make this experience possible for me. 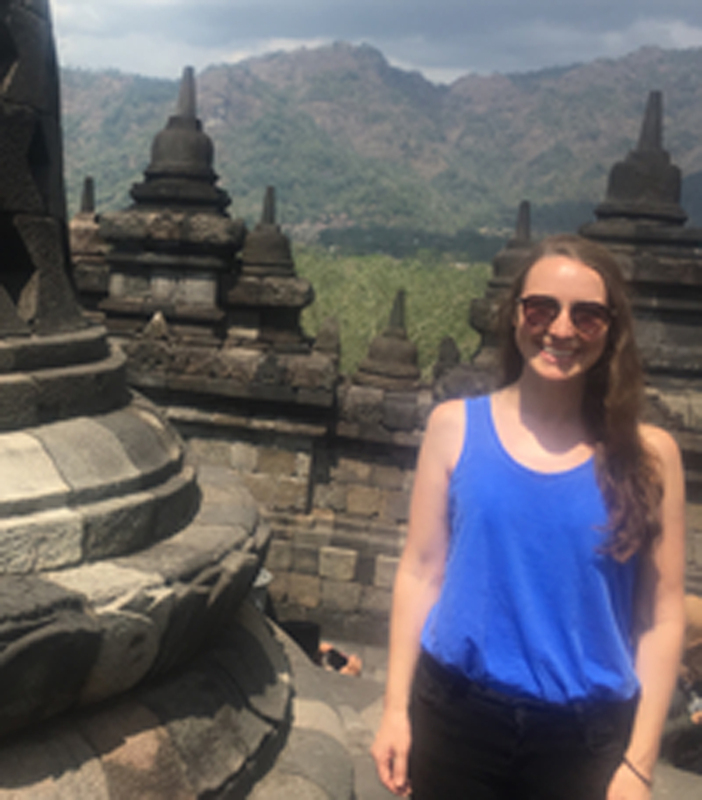 Lauren Schmeisser is a 3rd year Ph.D. student in Atmospheric Sciences at the University of Washington in Seattle. She studies ocean-atmosphere interactions during marine heat waves in the Northeast Pacific ocean. 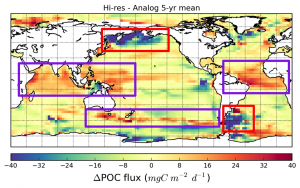 Using satellite data, buoy data, and climate model output, she aims to better understand potential feedbacks that contribute to persistence of these anomalously warm ocean events. The IMBeR ClimEco6 summer school was an incredible learning experience packed with lessons on science communication, modeling, social science, and climate change impacts. For a student working across both atmospheric and ocean sciences, the interdisciplinary approach to our lessons was invaluable. I left the school with a great network of potential collaborators, a better understanding of interdisciplinary marine science, and newfound motivation to approach my research with novel techniques. I’m so grateful for the support received from OCB to attend this excellent summer school! 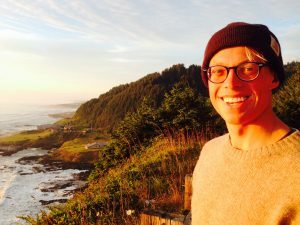 Zach Koehn researches how we can improve the connection between public health and sustainable fisheries as a Ph.D. Candidate in the University of Washington’s School of Aquatic and Fishery Sciences. You will find him on the water – in the early mornings or at sunset – every day he is not traveling. His current Ph.D. work uses quantitative and qualitative approaches towards 3 ends. First he analyzes national-level policy overlap between fisheries and health policies to meet food security and nutrition objectives. Second, Zach uses a mixed-methodologies approach to conduct a regional analysis focusing on increasing access and availability of underutilized fish on the U.S. West Coast to low income, low access communities, where diet-based disease burdens are high. Finally, he combines data sets on Life Cycle Assessment and nutritional composition to determine the environmental impact across terrestrial and marine animal food production systems in terms of their nutritive value. Prior to starting his Ph.D., Zach managed a community-supported, direct-to-consumer seafood distribution business on California’s central coast. Zach’s undergraduate and Masters degrees were both at Stanford University in philosophy and religious studies, where he evaluated cross-cultural identity under spiritual and social transformation in the works of Chinese-Daoist Zhuangzi and Italian-Christian Dante Alighieri. As he finished these degrees, he worked on campus for an ocean policy think tank Center for Ocean Solutions. In addition to his Ph.D., he participates in an intersectoral partnership between academia, private firms, and nonprofits to improve social responsibility in the seafood industry, and is a SESYNC graduate pursuit fellow working on understanding how urbanization mediates access of low-income communities to fishing areas for subsistence. I was excited to learn that I would be attending IMBeR ClimECO, and am thankful to OCB for the support. I am grateful for the opportunity to travel to Indonesia to meet students and professors engaged in interdisciplinary research from all over the world, and to feel a part of this community. My favorite in-class moments surrounded discussions on interdisciplinarity, as well as learning best-practices for engaging with the general public and policymakers. I also loved to wake up to the Muslim dawn prayer over the city on Yogyakarta and common across Indonesia. 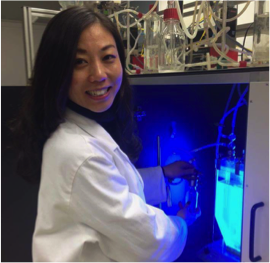 Shirley Leung is a 5th-year PhD student in Oceanography at the University of Washington. Advised by Dr. LuAnne Thompson, her current research focuses on characterizing tropical Pacific oxygen variability and understanding its potential effects on tuna movements and spatial distributions both in the present-day and the future. She uses large-scale observational data sets and output from global coupled climate models to conduct her research. ClimECO6 was an incredible experience. It was such a privilege to get to learn from some of the world’s most prominent social and physical scientists working in the marine sphere. I came away with a much better idea of how to do more societally relevant research and how to foster relationships with stakeholders and those who would use my science. I also gained a new appreciation for social science methodologies and the nuances and challenges associated with conducting interdisciplinary work. The best part, however, was getting to meet scientists and fellow early-career researchers from around the world. The friendships and collaborations created were really invaluable! Dr. Qian (Lydia) Li is a postdoc researcher at the Center for Microbial Oceanography: Research and Education (C-MORE) of University of Hawaiʻi at Mānoa. She received her PhD at Xiamen University (China) and spent one year as a postdoc at the University of Amsterdam before joining Steward’s lab at C-MORE. 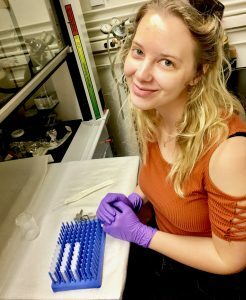 Her research interests focus on the interactions between nutrient and light limitation of phytoplankton and currently, she is working on an NSF-funded project investigating the three-dimensional ecological interactions among a mixotrophic flagellate, its prokaryotic prey, and an ingestible giant virus. This is my second time attending GRC and it’s still my favorite scientific meeting. What was different this time was that I also joined the GRS, which provided a great opportunity to meet and mingle with many other young scientists just like me. I love the fact that GRCs aim and always manage to bring a diverse community of scientists together, young and senior, female and male, from developing and developed, eastern and western countries. Besides the diversity, I also appreciate the gender equity among all the participants. In fact, I volunteered to host the first “Power Hour” forum for this GRC (Ocean Biogeochemistry) together with Dr. Christelle Not from Hong Kong University. It has turned out to be a big success, attracted a large number of attendees with both female and male scientists. Everyone was involved in the discussion and strategized how to build a gender-friendly work environment and promote professional growth of female scientists. I have a summary of it if anybody reading this is interested. Overall this GRS/GRC has been a wonderful experience that has also provided a great deal of scientific inspiration. I can’t thank OCB enough for supporting and providing me the travel funds. Aloha and Mahalo! 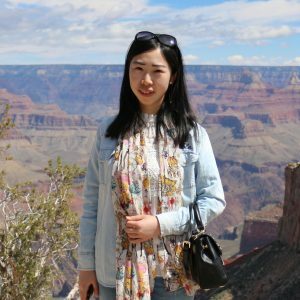 Pingping Qu is a fifth-year Ph.D. candidate in Marine Biology and Biological Oceanography at the University of Southern California. She works in David Hutchins’s lab and her studies focus on the responses of important phytoplankton groups, such as diatoms and diazotrophic cyanobacteria, to climate change. In addition to conducting lab incubations, she also recently participated on a research cruise in the North Atlantic Ocean focused on diazotrophs. 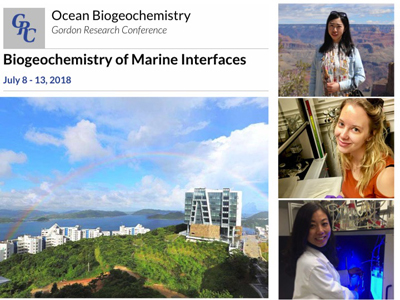 I really enjoyed the 2018 Gordon Research Conference (GRC) on Ocean Biogeochemistry in Hong Kong. The conference and seminar provided excellent opportunities for early career scientists to communicate with each other and more experienced scholars. I learned a lot from the talks, poster sessions and the “power hour”. This experience helped me build up a big picture for my research. I am very thankful to all the supporting organizations and people that contributed to the conference. I also really appreciate the travel funding provided by Ocean Carbon & Biogeochemistry for me. I have since given a short talk to my lab members and highly recommended the GRC to all of them. Plastic pollution is a problem that plagues the worlds’ oceans. Microplastics, or plastic pieces <5mm in size, are of particular concern given their bioavailability to organisms at lower trophic levels. Kassandra Dudek is a third year PhD student in Environmental Life Science at Arizona State University studying how chemical properties (e.g., sorption of organic contaminants such as pesticides or or de-sorption of additives such as flame-retardants) of different types of microplastics (or polymer types, denoted as “plastic 1-6” on our consumer products) influence the succession of its biofilm, degradation, and ultimate fate in the water column. The Gordon Research Conference was the most riveting, discussion-driven, and welcoming international conference I have ever attended in my graduate career. The casual nature of the conference gave me an opportunity to engage in meaningful scientific conversation, while also building my network and harnessing new friendships. While other international conferences felt intimidating, the GRC left me feeling comfortable and confident. I look forward to the opportunity to attend the next one! This workshop was held August 21-23, 2018 at the USGS Woods Hole Coastal and Marine Science Center, and brought together 28 researchers from 15 institutions to refine conceptual models of tidal exchange in coastal wetlands, with focus on dissolved organic and inorganic carbon, particulate carbon, and sediment. The group engaged in discussion of concentration and water flux measurement methods and frequency, instrumentation challenges in estuarine and salt marsh deployment, and modeling approaches to refine carbon flux measurements. In addition, they are working on continental-scale lateral flux estimates for the United States, an important term in the coastal carbon budget. Discussions highlighted the poor state of knowledge regarding this flux and its drivers, and the need for extended time-series of high-frequency measurements to capture variability in flux rates in these dynamic ecosystems. The continental U.S. flux estimation, and other related products are intended to be published in an AGU special collection on the U.S. coastal carbon cycle, including the journal Global Biogeochemical Cycles. The collection is open to submissions from anyone. Look for a session at the upcoming Coastal & Estuarine Research Federation (CERF) meeting related to this workshop. Learn more about this workshop and working group on their web page. Please submit your application to the OCB Project Office (hbenway@whoi.edu) by October 26, 2018. Applications will be reviewed by the OCB Ocean-Atmosphere Interaction Committee and OCB Project Office, and applicants will be notified by November 9 in order to accommodate the early bird registration deadline for the conference (November 15). Figure 1. Difference in annual mean carbon export (ΔPOC flux) between a high resolution (0.1º, Hi-res) and standard resolution (1º, Analog) global climate model simulation using the CESM model. Highlighted regions show areas where vertical (purple boxes) and horizontal (red boxes) changes in nutrient transport drive increases or decreases in export, respectively. Most Earth System models (ESMs) that are used to study global climate and the carbon cycle do not resolve the most energetic scales in the ocean, the mesoscale (10-100 km), encompassing eddies, coastal jets, and other dynamic features strongly affecting nutrient delivery, productivity, and carbon export. This prompts the question: What are we missing in climate models by not resolving the mesoscale? Authors of a recent study published in Global Biogeochemical Cycles conducted a comparative analysis of the importance of mesoscale features in biological production and associated carbon export using standard resolution (1°) and mesoscale-resolving (0.1°) ESM simulations. The mesoscale-resolving ESM yielded only a ~2% reduction in globally integrated export production relative to the standard resolution ESM. However, a closer look at the local processes driving export in different basins revealed much larger, compensating differences (Fig. 1). For example, in regions where biological production is driven by natural iron fertilization from shelf sediment sources (Fig. 2), improved representation of coastal jets in the higher-resolution ESM reduces the cross-shelf iron delivery that fuels production (red boxes in Fig. 1). Resolving mesoscale turbulence further reduces the spatial extent of blooms and associated export, yielding a more patchy distribution than in the coarse resolution models. Together, these processes lead to a reduction in export in the Argentine Basin, one of the most productive regions on the planet, of locally up to 50%. In contrast, resolving the mesoscale results in enhanced export production in the Subantarctic (purple box in Fig. 1), where the mesoscale model resolves deeper, narrower mixed layer depths that support stronger nutrient entrainment, in turn enhancing local productivity and export. Figure 2. An iron-driven plankton bloom structured by mesoscale features in the South Atlantic. Left is simulated dissolved iron (Fe), the limiting nutrient for this region, and right is iron in all phytoplankton classes, a proxy for biomass (phytoFe, shown in log10 scale), on January 11, the height of the bloom. Plankton blooms in the Subantarctic Atlantic are fueled by horizontal iron transport off coastal and island shelves and vertical injection from seamounts, whereas farther south in the Southern Ocean, winter vertical mixing is the primary driver of iron delivery. Mesoscale circulation, largely an unstructured mix of interacting jets and vortices, strongly affects the location and timing of carbon production and export. Click here for an animation. In regions with very short productivity seasons like the North Pacific and Subantarctic, internally generated mesoscale variability (captured in the higher resolution ESM) yields significant interannual variation in local carbon export. In these regions, a few eddies, filaments or more amorphous mesoscale features can structure the entire production and export pattern for the short bloom season. These findings document the importance of resolving mesoscale features in ESMs to more accurately quantify carbon export, and the different roles mesoscale variability can play in different oceanographic settings. Determining how to best sample these mesoscale turbulence-dominated blooms and scale up these measurements to regional and longer time means, is an outstanding joint challenge for modelers and observationalists. A key piece is obtaining the high temporal and spatial resolution data sets needed for validating modeled carbon export in bloom regions strongly impacted by mesoscale dynamics, which represent a large portion of the global carbon export. 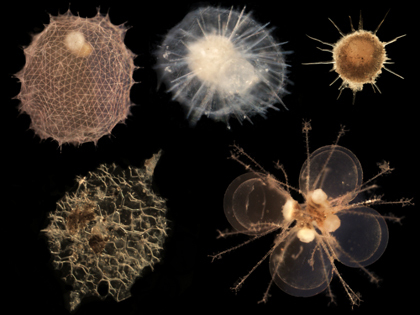 Phaeodaria are single-celled eukaryotes (a.k.a. protists) belonging to the supergroup Rhizaria. Like diatoms, phaeodarians build up skeletons made of opaline silica, but unlike their emblematic relatives, phaeodarians have been largely ignored in the marine silica cycle. 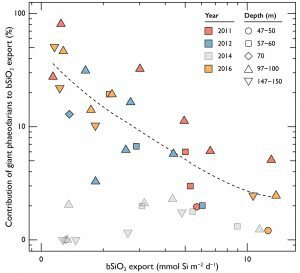 The contribution of phaeodarians to total biogenic silica (bSiO2) export is markedly enhanced at low total bSiO2 export (analysis did not include data from 2014 due to abnormally depleted phaeodarian population). In a recent study published in Global Biogeochemical Cycles (also see related Research Spotlight in AGU Eos), authors used a combination of extensive sediment trap deployments and in situ imagery during four cruises of the California Current Ecosystem Long-Term Ecological Research (CCE-LTER) Program off the coast of California to quantify biogenic silica export mediated by giant phaeodarians (>600 µm). These data revealed that giant phaeodarians possess among the highest recorded cellular silica content (up to 43 µg Si cell-1). 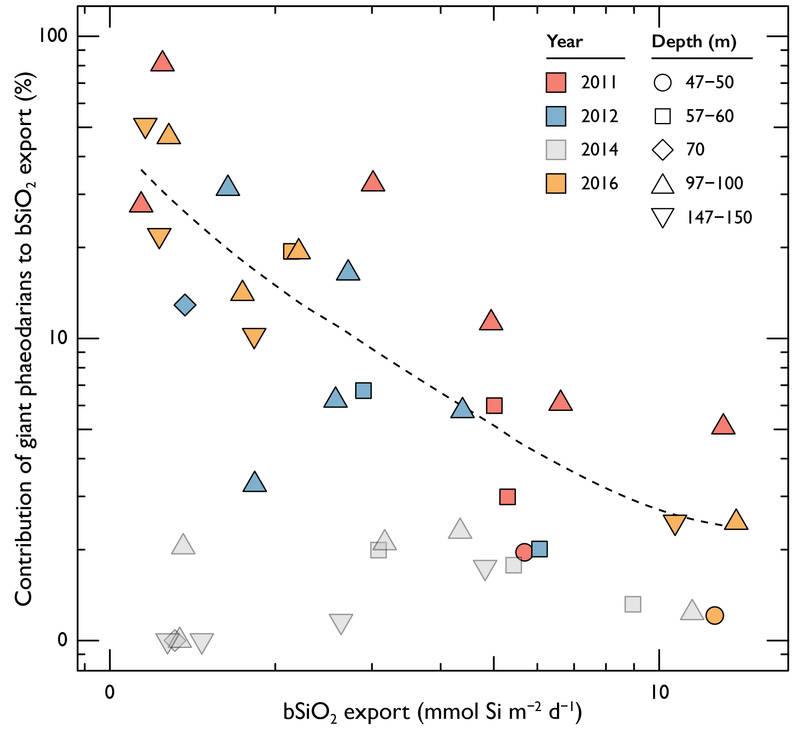 In addition, measurements of vertical fluxes suggest that these organisms can play a surprisingly large role in silica export (ranging from 10-80% of total silica export) in more oligotrophic waters. Also, because they are most abundant in waters below the euphotic zone, phaeodarians contribute to increased biogenic silica flux in the mesopelagic, in contrast with typically observed decreases in carbon flux with depth. Given their significant contribution to silica export, phaeodarians should be considered in global budgets and models of ocean silica cycles, especially in oligotrophic waters.